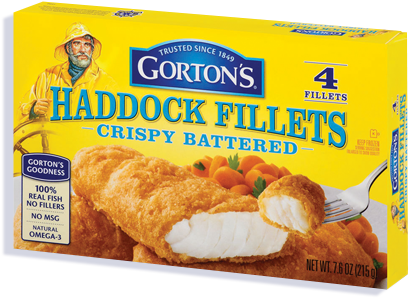 Wild-caught Haddock fillets in a delicious, crispy coating. There’s a reason our Crispy Battered Haddock Fillets are a classic family favorite. Dipped in freshly mixed batter and ready from the oven in under 20 minutes, it’s easy to turn any meal time into haddock time. 4. Bake uncovered 18 to 20 minutes* until coating is golden brown and crunchy. Turn fillets over after 10 minutes of cooking. Cook fillets thoroughly before serving. Microwaving is not recommended. INGREDIENTS: HADDOCK, ENRICHED BLEACHED WHEAT FLOUR (FLOUR, NIACIN, IRON, THIAMIN MONONITRATE, RIBOFLAVIN, FOLIC ACID), VEGETABLE OIL (COTTONSEED AND/OR CANOLA), WATER, MODIFIED CORN STARCH, LESS THAN 2% OF: BAKING POWDER (BAKING SODA, SODIUM ALUMINUM PHOSPHATE), SUGAR, SALT, PALM OIL, ONION POWDER, YEAST, WHEAT FLOUR, COLORED WITH PAPRIKA AND TURMERIC EXTRACTS, NATURAL FLAVOR, WHEY, DEXTROSE, SODIUM TRIPOLYPHOSPHATE (TO RETAIN FISH MOISTURE), TBHQ (TO PROTECT FLAVOR). 150 mg of EPA and DHA Omega-3 fatty acids per serving.